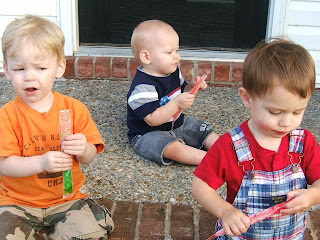 Ah, to be a toddler and have your life revolve around choosing a flavor of freezer pop. Hope you are enjoying the arrival of June as much as we are! Wow, small world! I know those two little guys...M and G! I used to teach with their mom! Precious boys and your little guy is most adorable as well! Have a great weekend! Very cute! I'm jealous; I could totally eat a freezer pop right now! Enjoy your summer off with Seth.